- Helen Littrell, mother of roommate living with human-alien hybrid, Sacramento, Calif.
May 30, 2014 Cedarville, California and Klamath Falls, Oregon - It is highly probable that all life on Earth was seeded by an advanced intelligence from somewhere else in the cosmos. That idea was first proposed by 1903 Nobel Prize chemist Svante Arrhenius, who introduced the concept of “panspermia,” the seeding of life through spores of living cells on different planets. Then 70 years later in 1973, Nobel Prize laureate Francis Crick evolved Arrhenius's concept to “directed panspermia.” After the discovery that DNA was a double helix molecule that contains the singular genetic code for all Earth life from bacteria and fish to plants and humans, Crick puzzled over why there was only one genetic code for all terrestrial life. That could not have happened by chance, he hypothesized. So Crick agreed with Arrhenius that life on Earth was likely seeded and directed by Advanced Intelligences. 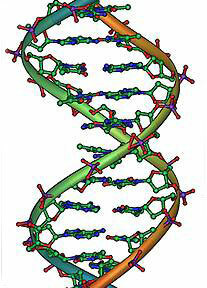 DNA double helix molecule. The genome “sentence” to make a Homo sapiens sapiens is about 3.2 billion base pairs long and contains 20,000 to 25,000 distinct protein-coding genes. Previous PostPrevious Plastic Microbead Trash from Oceans to Great Lakes Hurting Birds, Marine Life — and Humans?